Catch Des Moines has engaged JLL to facilitate the creation of a 10-year Destination Master Plan to guide tourism growth in the Greater Des Moines and Polk County region. 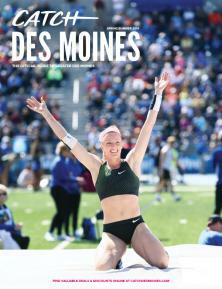 The eight-month project will help Catch Des Moines identify areas that—with proper investment and programming—would “move the needle” and encourage more over-night visits to the region. The overall goal of the master plan is to create a roadmap for Catch Des Moines to increase sustainable economic growth and development throughout the destination and to increase visitor and group business. The goal of the Destination Master Plan is to strengthen the destination and encourage more visitors to explore and discover the rich experiences the Greater Des Moines region has to offer. In helping craft the plan, JLL is working to create a plan that is not “the JLL plan”, but a plan that has been developed by and in conjunction all of the destination partners in Greater Des Moines and the communities Catch Des Moines serves. Engaging partners to establish key metrics to aid in the plan’s implementation. The resulting plan will set priorities for resource allocation and identify areas around which all of Catch Des Moines’ destination partners should be aligned. 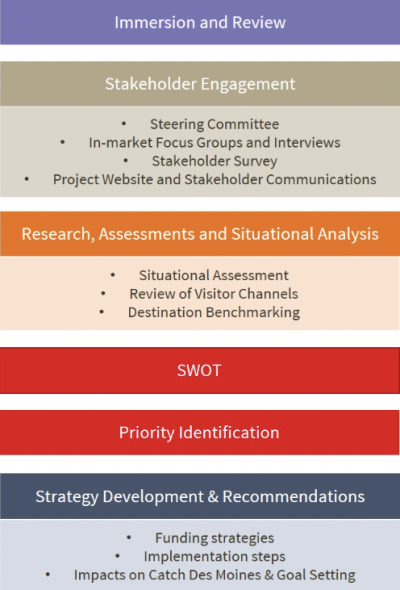 JLL’s approach to destination master plan development is based on the principle that strong stakeholder and partner engagement is critical to building tourism capacity. We appreciate and value the perspectives and experiences of the various partners and stakeholders in the region who contribute to the tourism industry and residents who have help build and support the area’s strong quality of place. To share your thoughts on how we should strengthen Greater Des Moines as a destination please contact David Holder, the project team leader, at david.holder@am.jll.com.